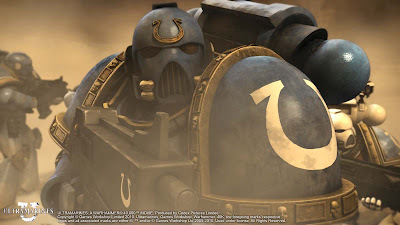 The other week, I spoke with some folks over at the Ultramarines movie and they generously offered to answer some questions I had for them about the film. Of course I opened it up to you all and here are the replies I got by email. I took the questions you all sent to me and forwarded them to some folks involved in the movie. These answers come David Kerney, Producer, Ultramarines: A Warhammer 40,000 Movie. 1. Looking forward to my preorder arriving. Do they have a distributor yet for the normal release? Yes, Codex is in discussions with a retail distributor for release sometime later next year. There’ll be an announcement in the first part of 2011. 2. Is it available for a limited time? 3. What space marine chapters appear in the film? any traitor legions' besides black legion? You’ll have to watch the movie! 4. Did they have all the voice actors in mind before the project started, or were auditions needed? No actors were in mind before the project started but many of them are very well known so it was clear what their voice talents would bring to the characters. It was important to have really great actors: the facial capture technology required that all the physicality of the role was conveyed within the face, able to move only 30 degrees in each direction when looking straight at the camera. Also these are men of war, stoic and dedicated – yet each individual characters: so the voices needed to be strong, rich and distinctive. We are thrilled with the voice cast. It is great to have such prestigious names attached to the movie and they have done the most fantastic job in bringing to life these Space Marines. 5. Are there tentative plans on doing more CGI films based on the Warhammer 40,000 universe? 6. Do they have any plans on doing a CGI film based on Warhammer Fantasy Battle? Well, we’d never say never. But at the moment, the Warhammer 40,000 universe seems to offer most scope bringing great storytelling to the screen. 7. GW has been approached by film makers for years and they have always turned them down. Why now and why Codex pictures? I think Codex’s approach to Games Workshop met what they wanted to see in the first venture into a feature-length movie: understanding and respectful of the 40k universe and of Games Workshop as rights owner, keen to produce a film that would appeal very directly to the huge international fanbase. Codex have worked closely with Games Workshop at every stage – which might have been difficult for a larger production company within the studio system. From the reactions to many of the hard-core 40k fans at the preview screenings, there are a lot which resonate strongly. The moments where familiar images from the Codexes or Games Workshop box art seem particularly to please. Director Martyn Pick’s distinctive style brings real excitement and tension to the battle scenes. Plus the amazing sound track or the sounds of the Bolters. You tell us! 9. Has the response/pre-orders for the movie met their expectations? Great. We’re really pleased with how it is going. The fans have been tremendously supportive. 10. How critical will the "general" launch in Spring 2011 be to measuring the overall (financial) success of the movie? All sales of the DVD are important to its success! But by changing the usual model, with the Producers themselves directly offering the Collector’s Edition first to the fan base before any general retail distribution, the intention is that the financial success of the movie is cemented from the outset. 11. If there are plans for future movies, what would be estimated development/production time? Although ULTRAMARINES was in development for about five years, the actual production was only 15 months, which is very fast for a 76’ CGI movie. So, yes, we are talking about another 40k project but it is far too soon to put any time line on it. This one has to be a success first! 12. I'm looking forward to seeing the Tyranids mentioned in the verbal description of the movie. My question would be, are there any other alien races in this movie? i.e. easter eggs to look out for. There are no easter eggs in the movie, but have a look at the bonus content. 13. Follow up question would be what alien races would they like to do in future movies? Well, obviously there are countless armies to chose from. In a way, that’s the real challenge - to narrow it down and work out which to feature. 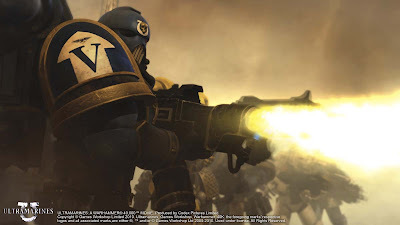 For the first movie, it was relatively straightforward – as a point of entry to the 40k universe, it needed to be the Space Marines, since almost everyone involved in the hobby has come into contact with them one way or another, and as the most elite Chapter the Ultramarines seemed a good starting point. But for a second movie... so much choice! 14. Are they concerned about illegal sharing and distribution? Isn’t it for every rights owner? 15. If this is successful, would they consider doing more movies with bigger budgets? Of course. it would be great to work with a bigger budget. 16. Is there a possibility of there ever being a full motion picture release of a 40k movie to the big screen? We’re hoping to do some limited theatrical screening next year for ULTRAMARINES, in the UK at least. More news to follow later this month. 17. Would they ever do a movie based off one of the Black Library's many books instead of an original screenplay? It was a conscious decision for this movie to start with an original screenplay. As Dan Abnett has said, writing a novel and writing the script for a film are two very different things and he and the Codex team felt that, given the vast back story of the 40k universe, it was better to start with a blank page and introduce new characters in a new scenario. Going forward? Who knows... but the most important thing always is that the script is a cracking good yarn which gets to the heart of the characters and the story in an hour and a half. 18. I would like to know the challenges of animating power armor, especially in terms of trying to model a realistic human anatomy in there somewhere. Did anything need a "redesign" to make it able to be animated? It was a challenge to animate the power armour, and we went to great lengths to really think about and explore how a Space Marine wearing it would move. One of the ways we thought about it was to look at someone wearing ice-hockey pads – it gave some approximation of the walk cycle. But, of course, it is power armour so not heavy. Games Workshop’s advice was that the Ultramarines are twice as agile and as fit as any Olympic champion, so the movement is still fluid despite the bulk of the armour. That about covers it, thanks to everyone for sending in their questions and Mr. Kerney for answering them. I would be interested in hearing more about these film makers that have approached GW over the years. Is there any record of them meeting with a major film studio? Thanks to Codex for entertaining our questions! I certainly learned some from their answers. I think the we in 40k community should support this, if we want to see our favorite 'grimdark universe' on-screen in the future. well, if you go on youtube, you can find a few low budget gw produced films from years back on there. years back there was 1 done of dark angels and an inquisitor goin up against world eaters who were tryin to summon daemons onto a planet. this was done with real actors in costumes, with basic cg effects. another there was 1 of space wolf terminators goin against a genestealer cult in the under sinks of a hive city. also done with real people and basic cg effects. and the most recent of all, which was talked about in white dwarfs in the early 200s was bloodquest, a cgi film following the blood angels series of novels. this was never completed, but you can find concept art, film clips, and the trailer, floating around on the net. As for the questions, they started out dodgey in there answers, but overall an interesting take. Very cool stuff, and thank you for the effort of making the QA session happen. "writing a novel and writing the script for a film are two very different things..."
As a writer, I can say this is a often unknown but VERY accurate statement. There are very distinct approaches for the various formats (stage, screenplay, serialized, etc.) which all have to address the strengths and weaknesses of the method. Again, thanks for the info, I look forward to buying and seeing the movie! the dark angels 1 i saw was in english i believe. if you go on youtube, someone has made a damn good 'story of the 40k universe' or something, using clips from those films i mentioned, ingame vids from starcraft + brood wars, clips from the warhammer 40k game of old 'final liberation' (used to have a copy in here somewhere...) as well as a few other sci-fi sources. Great Q&A! I'm really looking forward to getting my hands on the Blu-ray release in a couple of months!